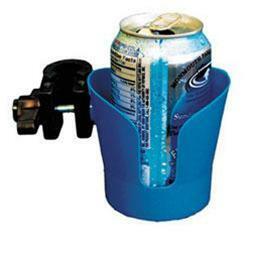 Plastic cup holder is slotted on two sides to hold a cup with handles and is accessible to left or right-handed people. It can also hold a glass, can or bottle. The rugged plastic clamp has a large easy-to-tighten lever knob. The clamp fits a 1" diameter tube and comes with a sleeve to reduce it to fit.